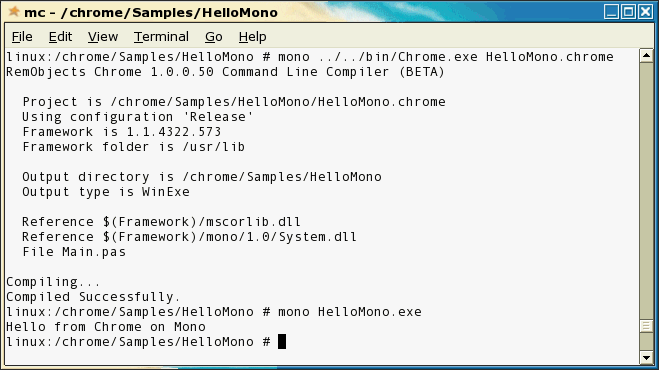 Dr.Bob's Chrome Shines section is all about the RemObjects Chrome language for .NET and Mono. Building .NET applications or assemblies usually means binding to one specific version of the .NET Framework, which means it's not always possible to use an assembly or application on another version (or on the Compact Framework or Mono for example). In order to support developers who want to target different versions of the .NET Framework (including the CF or Mono), Chrome offers a feature called Cross-Linking, where you can use the compiler under .NET 1.1 or 2.0 but still link against alternative CLR assemblies. Note that if you use for example .NET 1.1-specific classes or methods, then you will benefit from compile-type checking and an error message telling you the feature is not available under CF, when compiling against CF. In general, the Chrome compiler will tell you if it cannot resolve such things (with a compiler error, not a runtime error later - you are really binding to the specified version of the CLR). I'm very impressed by the ability that Chrome offers me to run on one .NET Framework version, and still link against different CLR platforms - including .NET 1.1, .NET 2.0, the Compact Framework as well as Mono. This will allow me to develop in one stable development environment (whether that's .NET 1.1, 2.0 or Mono) and still be able to deploy for other CLR platforms at will. This webpage © 2004-2010 by Bob Swart (aka Dr.Bob - www.drbob42.com). All Rights Reserved.